What Does Glatt Kosher Mean? The technical definition of glatt kosher is meat from animals with smooth or defect-free lungs. Today, the term is often used informally to imply that a product was processed under a stricter standard of kashrut, also referred to as the Jewish dietary laws. Due to this, glatt kosher is sometimes thought of as being "extra" kosher, but that is a misconception, and you will find the term used beyond meat products as well. 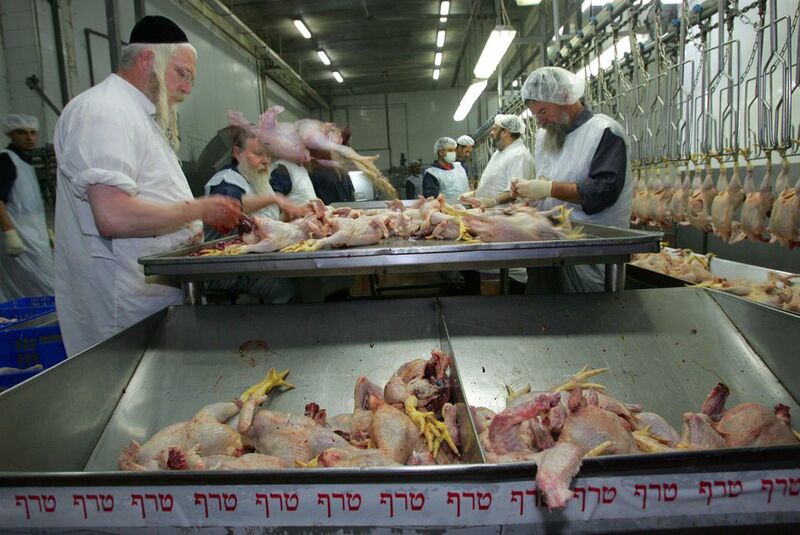 For meat to be kosher, it must come from a kosher animal and be slaughtered in a kosher way. In addition to those two conditions, for meat to be glatt kosher, it must also come from an animal with adhesion-free or smooth lungs. The word glatt means "smooth" in Yiddish—the word is chalak in Hebrew. In Jewish dietary laws or kashrut, the term glatt is used to refer to the lungs of animals. It is primarily concerned with the meat of adult herd animals, such as cows and buffalo. On occasion, small adhesions may be removed from the lungs and the animal is still worthy of the glatt kosher label. The catch is that when it comes to calves, sheep, deer, and fowl (chicken, turkey, and duck), they must be glatt in order to be deemed kosher at all in the U.S. If one of these products is labeled "glatt", it is misleading because if it were not glatt, it would not be kosher. After the animal is slaughtered according to kashrut, the animal is opened and examined to determine whether the lungs are smooth. If defects are found on the lungs during the inspection, the meat is considered treif (torn, mortally injured, non-kosher). This stems from the verse Exodus 22:30: "Do not eat meat from an animal torn [trefa] in the field." If the lungs are found to be defect-free or smooth, the meat is considered to be glatt kosher. While there is a special focus on an animal's lungs in defining glatt kosher, other physical defects can deem an animal non-kosher. These include broken bones, punctures or cuts, and terminal illnesses that would have caused the animal to suffer in life, all of which would designate that animal as treif. Some Jewish communities restrict their diet to glatt kosher meats alone. This is referred to as Bais Yosef Glatt. Other communities do not specify this requirement, so non-glatt kosher meats are acceptable. While the term glatt technically means the lungs of the kosher and kosher-slaughtered animal were smooth, the term is often used colloquially to imply a higher standard of kashrut. It is similar to the way the term mehadrin (food prepared in the strictest kosher way) is used in Israel. However, just because a product is glatt, does not mean it is necessarily higher quality or more kosher than a non-glatt meat. Even though only meat can be technically glatt kosher, the term is often loosely used today to refer to non-meat items. Many suppliers of glatt kosher items will refer to all their products as glatt kosher. You may, for instance, find fish with the same glatt kosher sticker as is used on meat being sold one aisle over. In addition, many suppliers of glatt kosher meat will refer to their whole service as glatt kosher. So don't be surprised to see bakers, caterers, restaurants, and stores labeled as glatt kosher.​ In many instances, it is a marketing technique and a rather misleading label. If you have concerns about glatt kosher products, it is best to purchase meats from a reputable source that you feel you can trust.